Comparing these two mattresses can be rather difficult because they are at such different stages in the mattress industry. This being said, there are some interesting similarities and differences that people should consider if they are thinking of purchasing one of these mattresses. Tempurpedic is the king of the foam mattress industry – it has been around for 25 years. Loom & Leaf on the other hand is a relative newbie to the industry. They’re one of the numerous mattress manufacturers that saw an opportunity to bring foam mattresses to the masses. Previously, they were a luxury that only few could afford. If you’re thinking of purchasing either one of these mattresses, or you have a general interest in finding out what the latest mattress models are, this review will be a great starting point. After finishing this review, you should have all the information you need to determine if either of these mattresses is right for you. Loom & Leaf started producing their mattress in 2015. 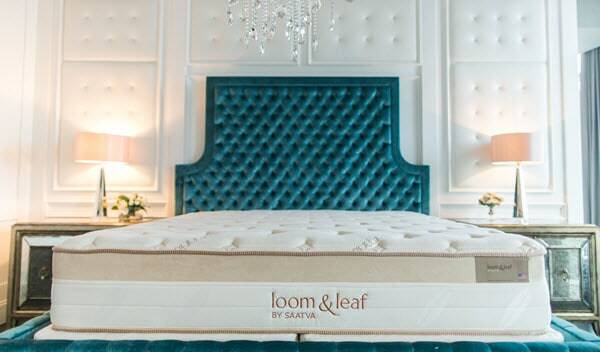 Despite only having two years of experience in the industry, the Loom & Leaf mattress has grown wildly popular. This is down to two things: price and comfort. They are able to provide their customers with a truly luxury mattress at a fraction of the cost of many competitors. They also provide a range of other benefits that are included with every mattress purchase. 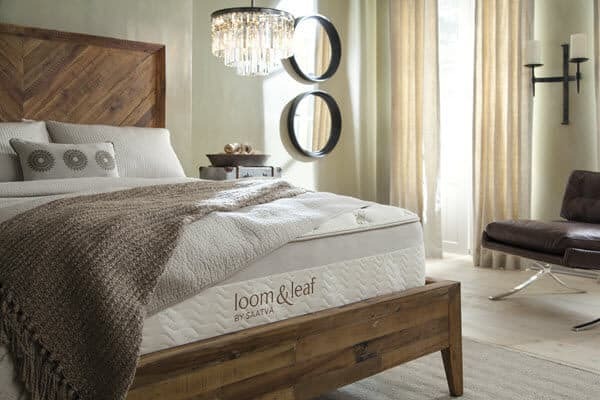 With every Loom & Leaf mattress purchase, you will receive a 15-year warranty, which is five years longer than the majority of mattress providers in the country. In addition, you’ll also get 120 days to return your mattress for a full refund should you decide you don’t want it – this is about 20 days longer than the average mattress provider. The only downside to Loom & Leaf is that they’re one of the few new online mattress companies not providing free shipping. This is one of the most unique parts of the Loom & Leaf mattress – it is manufactured using a gel foam that is specifically used for these types of mattresses. It provides a high degree of breathability and comfort that other mattress materials are unable to do. If you’re looking for a mattress that does a great job at dissipating heat, this is a great option. The top layer of the mattress is 2” thick. This is another component of the mattress that is designed for comfort. 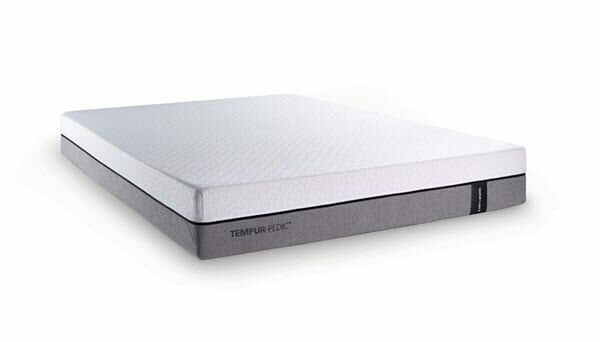 It is made from visco-elastic memory foam – similar to that used by the top layer of the Tempurpedic Cloud. This layer is 2.5” thick. This helps provide the hug that you look for when you purchase a foam mattress. This is a loft pad constructed layer that is 2” thick. This is in place to provide a solid buffer zone between the top and bottom layers. It allows for a smooth transition to the support layer. This is the support layer of the mattress. It is constructed using extremely dense advanced foam. This is the most firm component of the mattress and it allows the rest of the construction to prioritize comfort. Loom & Leaf takes a new twist on the mattress cover. Many modern-day producers use artificial materials to create thin and stretchy mattress covers. Loom & Leaf uses organic materials to create a soft and natural approach to a mattress cover. Organic cotton is combined with natural thistle to make the cover – this also happens to be extremely flame resistant, which is a breath of fresh air from the typical polyester cover. This cover also provides much better support than your typical cover, but it does hide the texture of the mattress which some people may find annoying. Loom & Leaf is very comfortable mattress. It uses its unique components to make a mattress that is as high of quality as many more expensive competitors. Previous customers believe that the mattress is a comfortable option no matter what position you sleep in. Some are even saying that the mattress has managed to fix years of bad sleeping habits – a welcomed benefit you may be interested in. 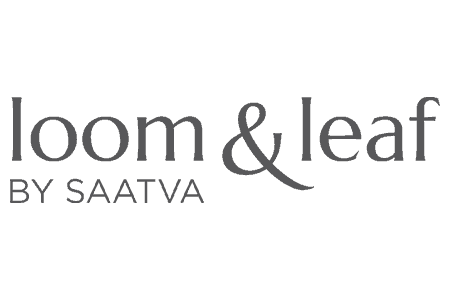 In terms of support, the Loom & Leaf scores around a 5.5/10. This is only slightly higher than the Cloud, but it can really go a long way if you think that you need just a bit of extra support. This form of mattress is a perfect fit for anyone who is a normal weighted sleeper, or lighter than average. This is because you won’t feel like you are on top of the mattress. Your body will be able to sink into the contours and be hugged by the mattress, without going too far. The Loom & Leaf is also a great mattress when it comes to motion transfer. You can move on one part of the mattress without it impacting the rest of the mattress. As you’ll see, you will be able to not be woken up by a partner who moves frequently in the night. The gel top layer of the mattress also ensures that the mattress cools efficiently. This is great for those who often overheat during the middle of the night – you’ll no longer have to suffer through having a heat intensive mattress. 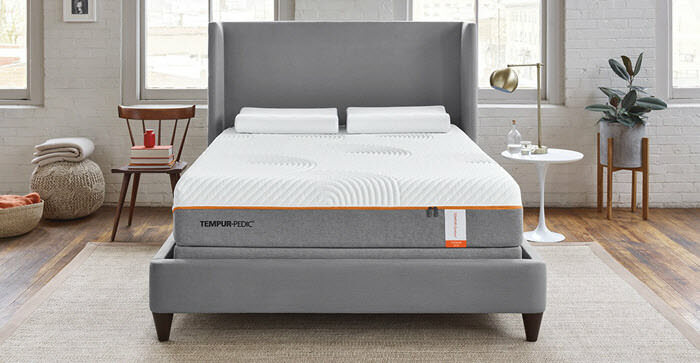 Tempurpedic is a luxury foam mattress brand that entered the market back in 1992. It has been one of the most popular luxury mattresses for over 25 years. If you think of a memory foam mattress, you most likely think of Tempurpedic. 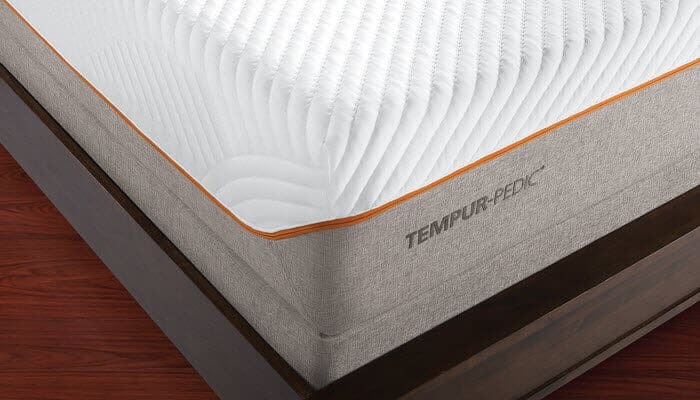 Unlike many of the new entrants to the foam mattress industry, Tempurpedic has their mattresses available to view in show rooms. You can go and try one out in multiple stores in almost any city in the United States. The main downside of Tempurpedic mattresses is the price – they’re one of the most expensive mattresses in the country. The most popular Tempurpedic mattress is the Cloud – it owes its name to the comfortable feeling the mattress has. If you buy a Cloud you’ll also receive a range of additional benefits. Every Tempurpedic mattress is shipped to your home directly and completely free of charge. You also get a 10-year warranty on the mattress. You’ll receive a 30-night trial, but won’t be able to get a full refund – only an exchange. Fortunately, you can try the mattress out in a showroom before purchasing one. The Cloud is constructed using some of the most advanced techniques and materials available in the mattress industry. The Cloud consists of four separate layers that each do their part to create the most comfortable and unique sleeping experience possible. Additional information regarding each layer and its components is provided below. This is the most famous component of the Cloud – it’s constructed with 2” of visco-elastic memory foam – this is the type of foam that you feel when you first touch a Tempurpedic mattress. It truly makes you feel like you’re sleeping on a cloud – you’ll feel the hug and contour around your body shape when you first lie down. This layer is actually formed out of the same unique material that makes up the top layers. The only difference is that this layer is slightly denser, which means that it adds a bit more support to the top layer, while also contributing to the comfort. It is also 2” thick. This layer is the thickest layer of the mattress – it measures in at 4” thick. This layer allows for added support and constructed using polyurethane foam. This is the bottom layer of the mattress – it’s 3.5” thick and provides the bulk of the support that the mattress needs. It is constructed using highly dense polyurethane foam. The cover of the Cloud is a fairly basic design. It is made entirely of the same material – which consists of a polyester and spandex blend. It allows a greater degree of breathability than many other mattress covers, but follows the same minimalist trend that many foam manufacturers have been using over the past few years. The intention of this is to not allow the cover to interfere too greatly with the texture or feel of the mattress. There is no denying that the Cloud is one of the most comfortable mattresses available anywhere in the world. Owners of the cloud rave about how wonderful it is and how you truly feel like you’re sleeping on a cloud. The hug and the contour provide a great feeling if you enjoy sleeping on this type of mattress. The only downside with the Cloud is that it retains heat more than some of the new foam mattresses – this is because memory foam often retains heat more than other types of foam. This being said, the mattress is still breathable so it won’t be an issue unless you’re a very sensitive sleeper. The motion transfer on the Cloud is next to none. You can literally jump on one end of the mattress without impacting any other part of the mattress. This is great for those who have partners who often move frequently in the night. In terms of support, the Cloud falls right in the middle – we’ve rated it at a 5/10. This tends to be great for the majority of people looking to purchase a mattress. Although it must be said, if you’re heavy sleeper, this mattress might not have the support you need. You may feel as though you are sinking into the mattress. Fortunately, Tempurpedic also have a bunch of other mattresses at varying support levels that you can try out if you feel you need something different. As always with Tempurpedic mattresses, the first thing you should ask yourself is whether or not you can afford it. The Cloud is a superior mattress, but it might not be worth the cost if it’s out of your price range. The Loom & Leaf mattress has done a wonderful job of providing an affordable mattress with a lot of similar traits to the Cloud. In fact, if you feel you are sensitive to heat when you sleep, the Loom & Leaf mattress may be a better fit altogether.